Architects tend to have a very good sense of space in three dimensions. From two-dimensional drawings they can interpret and visualize the final building or space in three dimensions. Unfortunately, very few of our clients can ‘see’ a space from looking at the drawings. They see a 2D plan (layout) and 2D elevations (vertical walls, typically exteriors), but meshing it together is a challenge. Virtual reality tools and renderings overcome that obstacle. A client using VR not only sees a space, but feels it, too. An ‘immersive’ experience allows the user to perceive walking around in a space, feel its proportions and see pathways and connections. The architect’s plan becomes tangible. When both client and designer experience a project in 3D, design development becomes clearer and faster. Revit is the designer’s choice of architectural design programs. From basic ‘napkin’ sketches to preliminary designs, Revit supports continued development and detailing right into VR conversion. The design model can be large or small, simple or highly detailed. When clients can ‘see’, feedback comes quickly and with greater assurance. Modeling is a powerful compliment to visioning and material boards. Leaping into an immersive experience creates a whole new level of understanding and design. Because environments are so much easier to experience in the VR environment, clients and designers can make efficient real time decisions and modifications. Real time rendering allows adjustments on the fly to change colors, fixtures, furniture, etc. This iterative process happens in minutes or days instead of weeks. Depending on need, reviews can be held at any time. Clients better understand their options, are more confident in their decision-making, and make fewer changes going forward. One of our most recent clients, Black Box VR, is an immersive VR and fitness experience. The owners were extremely comfortable with VR and virtually walking through and feeling their space over the course of development. This is rare. The beauty of VR for architectural design is that it can accommodate all levels of client comfort. The VR experience is simultaneously shown on a large, high-res monitor as it is seen by the user in real time. In CSHQA’s application, a second, smaller monitor shows the floor plan and pinpoints the user’s location. A skilled user can walk-through and use a hand-set pointer tool to identify the exact element he or she wants to discuss. Some clients prefer to use the oculus and allow the facilitator (designer) to control movement through the keyboard. And some clients prefer to watch on the monitor without the headset. Google-hosted WebVR – cloud supported, multiple fixed locations with 360 views. VR enables greater collaboration across all disciplines by enabling architects, engineers and other specialists to visualize the contextual space more fully and earlier in the design process. This contextual visualization promotes greater design precision for all disciplines and provides an understanding of how materiality will impact the spaces. Many fixtures and finishes once assumed standard installation by the contractor. Such as a standard measurement from floor to light switch. Now they must be specified in all three dimensions for accurate depiction in models and VR simulations. Lighting fixtures are a good example. When precisely placed in the model, particularly in the vertical dimension, the owner and design team can ‘see’ both location and lighting effects. Small adjustments in verticality, lamp, temperature, or even the fixture itself, can be experienced immediately. During design for Black Box, the owner and design team were able to ‘test’ the light fixtures. Small adjustments were made up and down in context with the ceiling to establish the exact measurement for locating the fixtures into the ceiling. CSHQA began rendering 3D models from Revit files 6-8 years ago. Static image files were used for sharing with clients and business development. At the computer, the model could be manipulated and rotated to demonstrate multiple views and create multiple images. As modeling programs advanced, the models became more flexible and the operator could change reference points and move point to point through the model. Then followed ‘fly-through’s where the reference points were no longer discrete, but continuous as the image changed around the travel path. For the most part these effects were still contained in the monitor…until smart phones had the capacity to render the models in real time and gyroscope capabilities within a moving phone. Soon Google Cardboard (VR on the GO!) were super cheap and fit over the phone to give a more realistic 3D sensation. CSHQA was demonstrating its 3D models with Google Cardboard in 2016. …. to name a few. Within CSHQA the response has been excitement and curiosity! 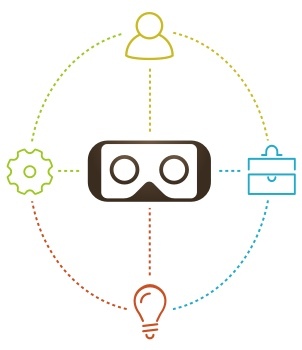 Integrating VR into our design process elevates the level of detail and validates the user experience. The ability to ‘feel’ the space allows clients and designers to understand each of their decisions and ultimately leads to better projects. As we integrate VR into our design process, project timelines are changing. Projects using VR are experiencing increased productivity during internal design meetings of architects, engineers, lighting, interior and environmental designers. CSHQA has dedicated an open corner of our office for the VR Zone, allowing for anyone to explore a project in VR. Staff can watch demonstrations and look in on team meetings. Multiple design studios are using VR, and additional staff are eager to apply the tools in their work. Rory Heggie, AIA, LEED AP, Architect, is a project manager with CSHQA. He specializes in design of hospitality and retail venues. Jim Marsh is a Senior Architect with CSHQA specializing in retail, hospitality and multi-family development and design. Together, Rory and Jim are spearheading CSHQA’s VR program, training and adoption.